Some interesting trailers flashed on my Youtube homepage today. They all looked distinctly differently From each other. I thought I would watch them all and do a review. 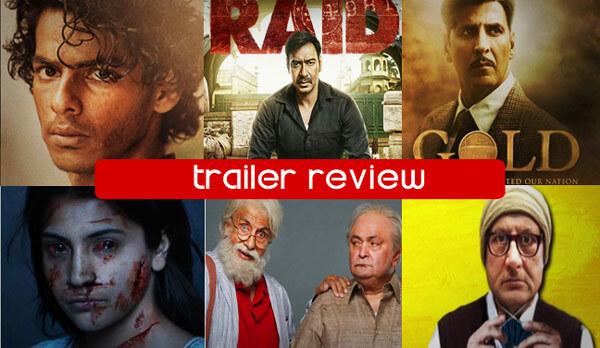 So here are my reviews on Beyond the clouds, Raid, Gold, Pari,102 not out and Baa Baaa Black Sheep. The was the first trailer that caught my eye. Acclaimed Iranian filmmaker Majid Majidi’s first tryst with Bollywood.What surprised me was it is a Hindi film. Little strange for a foreign director. Anyway, it was good to know. My first impression was that it looks like an inbetweener between Salaam Bombay and Slumdog Millionaire. Not sure about the story, but another refreshing take on Mumbai by an outsider. Yes, I consider Mira Nair as a foreign director too. They have a unique approach to capture Mumbai which no Bollywood director ever attempts. Though Anil Mehta is the D.O.P, the vision is undoubtedly Majidi’s. The city of dreams theme is what commonly seduces most of them about Mumbai, and this one looks no different. The trailer is crisp, sharp and promising. Though a distinct departure from Majidi’s kind of cinema like the Children of Heaven, The Father, The color of Paradise, etc.It is probably his first attempt on a bigger canvas and yet he sticks to newcomers and nonactors. This time he explores a darker theme. Newcomer Ishaan Khattar looks promising at such a tender age. A confident start to a promising career for this new kid who is also Shahid Kapoor’s half-brother. Malvika Mohanan looks beautiful and makes an excellent start to her Hindi career. Majidi preference of Malavika over Deepika Padukone seems to work.Malavika is the daughter of acclaimed cinematographer K.U Mohanan who shot Don, Miss Lovely. Talaash and Raees. Another actor who grabbed a meaty role is Bengali filmmaker Gautam Ghosh. Vishal Bharadwaj’s dialogues are fierce, but the lingo doesn’t quite gel with the slum twang. It may jar your ears if you watch it throughout in the film. It is more North Indian Hindi than a Mumbai one especially when you are brought up on the Mumbai streets. The film looks to be a winner, and Ishaan Khattar is going to milk the most out of it. I hope Majidi won’t disappoint and we are in on some excellent cinema when it releases. After a long hiatus of five years, Rajkumar Gupta has convinced Ajay Devgn for his next venture Raid. The movie seems taken from an actual incident in the early eighties. Frankly, if you research on the net, you won’t find any record of a 420 crore raid. In 1981, the only significant income tax raid was on a congressman Sardar Singh. But, only a few crores were recovered. So, it remains to be seen which raid filmmaker Gupta is talking about. Now about the trailer, the dull blue tone reminds me of Drishyam and the raids of Special Chabbis. But one can’t ignore the strong dialoguebaazi and drama woven around the story. Raid looks a notch up than the filmmaker’s previous Ghanchakkar. The period look doesn’t come through. I feel the colorist nowadays contribute a lot to destroying the tone of the film. The trailer lacks the hinterland rawness. Another awaited teaser trailer from the Excel camp is out. Akshay Kumar starrer GOLD is Reema Kagti’s next after Talaash. Again this is a periodic film with a flavour of sports. It dates back to our pre-independence era and how India grabbed their first gold medal in hockey. The production looks rich, and the art is commendable. The film promises the typical sports drama. So another hockey film after Chak de and another sports period film from the pre-independence era after Lagaan. It was more of a teaser than trailer without any glimpse of Farhan, the other lead in the film. Akshay has developed the knack of choosing good scripts. The wait is long as it releases in August. The main trailer is probably a few months away. Now, this is not a trailer, but a teaser. But, you can more or less know what the film is all about. The theme looks very similar to Bhoot. Bengali actor Parambrata Chatterjee is seen once again after Kahani and Traffic. The horror genre depends heavily on the sound and scare-tactics with full closure on the mystery behind the scare. This film looks no different. Writer-Director Umesh Shukla who delivered OMG is once again coming with an exciting concept. Amitabh Bachchan and Rishi unite after 26 years. They’re last together was I think Ajooba. My memories of the duo were the Manmohan Desai gems like – Amar Akbar Anthony, Naseeb, and Coolie. In 102 not out, they play father and son. 102 not out is a film version of a famous Gujarati play, and Umesh Shukla excels in repackaging them into movies. His movies are high on dialogue-based storytelling and low on cinematic techniques. So, no surprise here but Bachchan and Kapoor look to have a great time. I hope the audience share their fun too. I had to include this film trailer in the list because it is not only a quirky comic caper but also Anupam Kher and Annu Kapoor appear to be in full form. Actor and Producer Vishwas Pandya’s “ Baa Baaa Black Sheep” has a desi kingsman flavour. Manish Paul is back after Mickey Virus along with Kay Kay Menon. The dialogues are quirky, and so are the characters. Manjari Phadnis may be the bad apple here. The trailer has some funny moments, and I wanted to support this small movie among the big ones above. The only problem with small films is that they are good in content but equally bad in execution. But the two stalwarts seem to have their timing in place. Though the story shows a tendency to stray from the main plot and it can slide the film down. I hope it is not a series of gags and has a tight, engaging story. Do you agree with all my reviews and which are the ones you will put your money on? Please comment below and start a discussion.